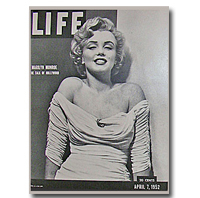 Vintage Marilyn Monroe LIFE MAGAZINE POST CARD. This postcard was issued by LIFE MAGAZINE in the 1950s to honor Marilyn Monroe is very rare. The description on the back side states the photo is from the 1952 Life Magazine cover. The postcard measures 3-3/4 x 5 and is in MINT condition.